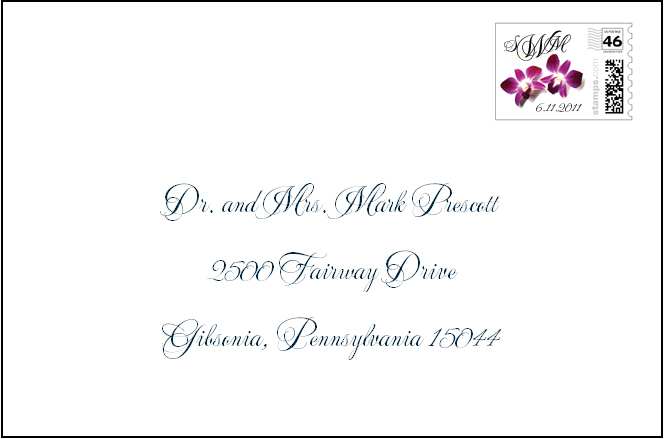 Envelopes can be computer addressed to coordinate with your beautiful invitations using a complimentary font and color. If you haven't started your addresses, ask ask me to email you my suggested Excel setup. Price is 1.00 per outer envelope...and .50 more if you are printing names on the inner envelopes. If you order your invitations from JB Ink... invitations will be shipped to you and envelopes directly to me. Addressing will take only a few days. Remember to order 25 extra envelopes. I'm always happy to keep some extras for errors, changes and additions.